In late 2018, the Old Orchard Grove Residents’ Association (OOGRA) changed its name to the Upper Avenue Community Association. While SAHRA is not against a name change for OOGRA, we are concerned that the new name will be confusing to anyone searching to find a residents’ association in our area. 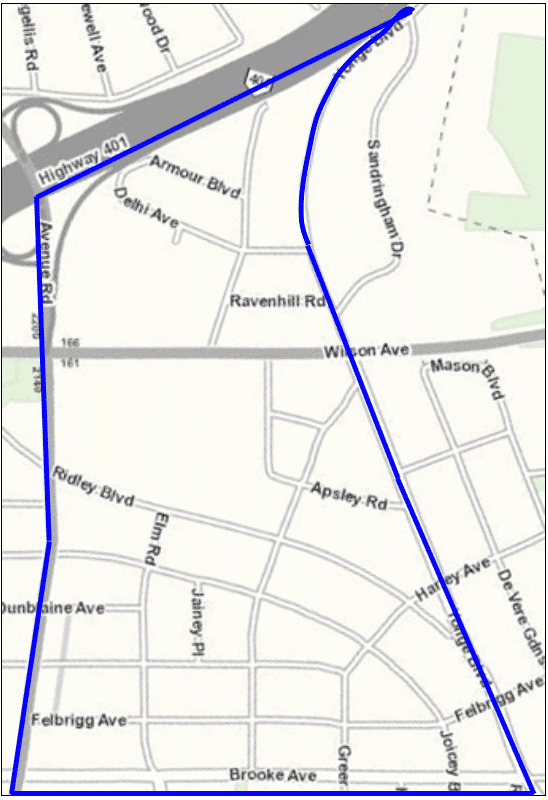 Rest assured that SAHRA will continue to represent the residents within our boundaries (Highway 401, west side of Yonge Boulevard, south side of Brooke Avenue, east side of Avenue Road). Despite its name, the Upper Avenue Community Association (UACA) will represent the same area as OOGRA did: Wilson Avenue, Avenue Road, Lawrence Avenue and Bathurst Street. UACA’s executive has stated that they will refer to SAHRA any resident who lives within our borders. Letters of Patent were issued on June 16, 1988 by the Ministry of Consumer & Commercial Relations (Ontario Corporation Number 771757) for South Armour Heights Ratepayers Association Inc. as a corporation without share capital. The Letters Patent qualified that the corporation was to be carried on without the purpose of gain for its members and any profits or other accretions to the corporation shall be used in promoting its objects. The head office address was given as 166 Ridley Blvd, the home of William Dolan (a Planning Consultant). The other directors were Dorothy Clark (Retired) of 68 Belgrave Avenue and Catherine Ann Gifford (Teacher) of 11 Haddington Ave. William G. Whiteside was identified as the Vice-President. To protect individuals through the joint action of all members of the association. To promote, foster and protect the public, social, cultural and recreational interests of the area served by the association. To gather information concerning the objective set out in paragraph 1 and development proposals, proposed changes to the official plan and zoning by-laws from members, the Municipality and the Planning Advisory Committee, and to take the necessary action as so determined by the Association. To protect South Armour Heights Ratepayers from inappropriate planning and development from residential, commercial, transportation and any other Government sources. To promote safety and security in the South Armour Heights neighbourhood. To enhance the environment and social life within the community. 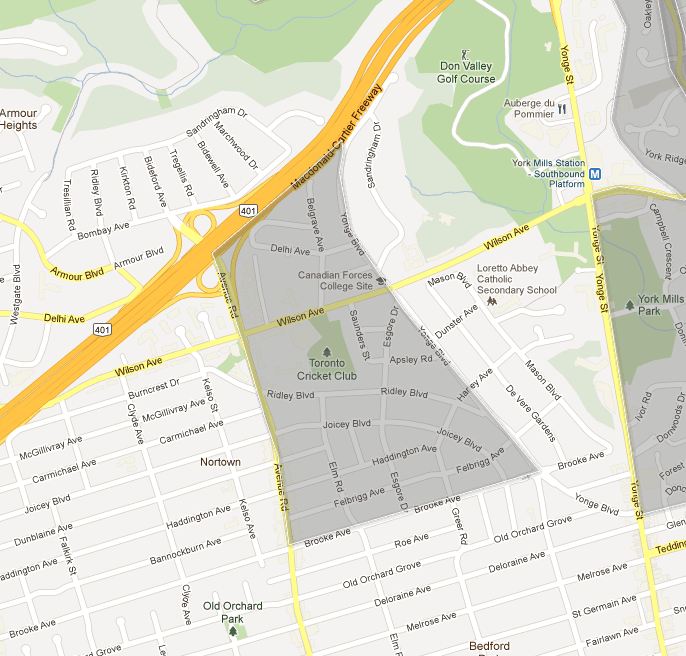 From a census perspective, SAHRA is included in the #39 Bedford Park-Nortown area which includes the homes south of the 401/down Yonge St; along Brooke; down to Otter Crescent; down to Hillhurst Blvd over to Bathurst on the west. It incorporates the York Mills Heights Ratepayers’ Association, SAHRA, OOGRA – now the Upper Avenue Community Association, the Bedford Park Residents Organization, and a portion of Lytton Park Residents’ Organization. The census contains interesting data on Population – makeup and ages, types of dwellings, living arrangements, marital status, size of family, types of families, income levels and languages spoken. David Topping, a young journalist, was engaged in developing an on-line map of all of Toronto’s residents associations and neighbourhood groups. The Toronto Atlas of Neighbourhood Groups and Organizations (TANGO) took over the project started by David Topping to map residents’ associations in 2018. The Federation of North Toronto Residents’ Association has used the TANGO mappings to prepare a mapping of all the Member RA’s of FONTRA. 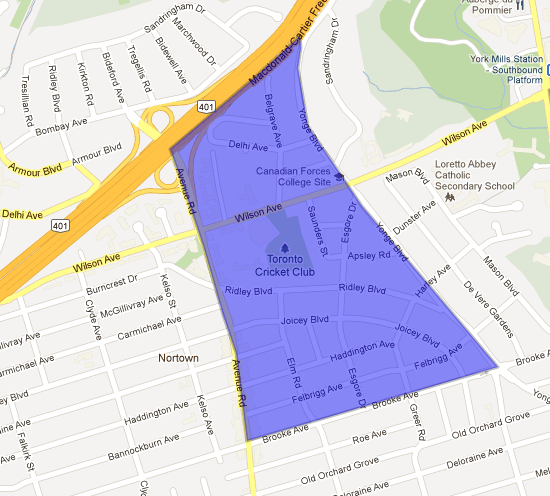 This mapping shows the wide area of midtown that they cover.